Posted on March 24, 2015 March 24, 2015 by et Al. 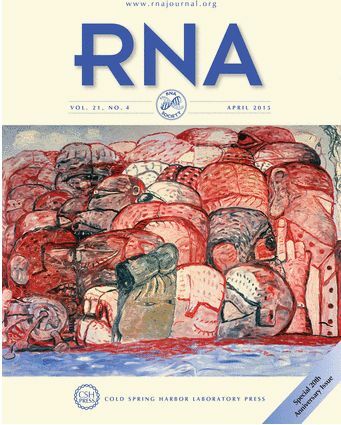 The RNA Journal is twenty years old and as part of their anniversary around 130 researchers in the field of RNA biology have contributed some of their personal reflections of working in this area. Contributors include Douglas Black, Michael Rosbash and Alberto Kornblihtt. As a relative newcomer to the field of AS, I think it’ll be useful for me to delve into these articles – they seem to be a refreshing way to learn how quickly research into AS has ‘evolved’ as well as providing an honest outlook as to what areas seem to be a priority for future work. The cover art in interesting too – it is entitled ‘Group in Sea, 1979, by Philip Guston‘. He was an American abstract expressionist painter.